Window on Cherry Pie Lane » Blog Archive » Day 237 Monkey! 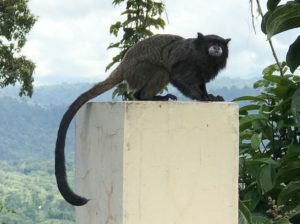 Who would have guessed that there would be monkeys coming to visit while I sat on the porch Shooting Hummingbirds. This entry was posted on Monday, August 20th, 2018 at 11:50 am	and is filed under Photography. You can follow any responses to this entry through the RSS 2.0 feed. You can leave a response, or trackback from your own site. Looks like a cross between a lemur and a cat!